For the fans of the Aliens movies, The Complete Aliens Omnibus: Volume 1 by Steve Perry and Stephani Perry is a must have for those who love great scifi, especially in the space marines genre. Bringing three novels together into one collection (Earth Hive, Nightmare Asylum, The Female War), Titan Books has given those that love aliens the extra stories and depth they wanted from the films but may not have gotten as the franchise developed. Starting with Earth Hive, the Omnibus sets the stage for more alien brutality and horror. Taking place just after the events in the Alien 3 movie, Earth Hive is a dark story of two survivors, each imprisoned by the government after having lived through a “nuclear accident” a decade earlier on the mining planet called Rim. One, Billie, has been committed to a mental hospital; while the other, Wilks, has been in military prison. Neither of them have gotten over the alien nightmare they faced on the far off planet of Rim. They are the only survivors, and their guilt refuses to let them find peace. Unfortunately, the powers that be, both corporate and government, want to use the aliens as their own weapons, so peace is a far off pipe dream. Earth Hive spotlights the absurdity that comes from unbridled greed and power, showing the reader that no matter how much Man wants to play God, humans will always be mere mortals—mortals that are food for the aliens. Moving on to Nightmare Asylum, Billie and Wilks are now on their own and facing an almost deadlier foe than the aliens: a megalomaniacal general who believes he can control the aliens and turn them into his own fighting force. A pure psychopath who has no regard for human life unless it promotes his grandeur, the general kills everyone and everything in his path, firm in his belief that he will be remembered through history as the man that tamed the aliens. The last installment in the Omnibus, The Female War, brings back the true protagonist of the Aliens franchise: Ripley. With Billie and Wilks free of the clutches of the insane General Spears, they find themselves on the Gateway moon base, the last sanctuary for humanity. Earth is overrun by the aliens and nothing but a desolate, post-apocalyptic nightmare. But that isn’t the only nightmare. Survivors all over the base are having dreams of a mega queen alien who calls to them, speaks to them, tells them to find her and serve her. Those strong-willed enough, under the leadership of Wilks and Ripley, decide they should go do something about it and set off to find the queen. Their intention is to bring her back and use her as bait to get the alien drones in one place on Earth. Then blow it all to hell. 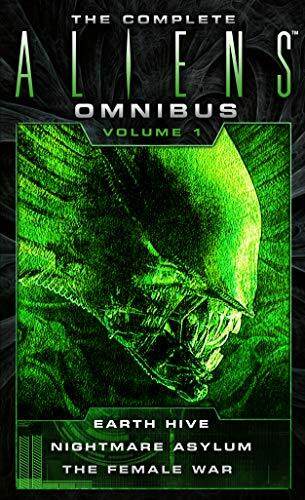 Filled with the intense action and horror that Aliens fans have come to love, The Complete Aliens Omnibus: Volume 1 fills that narrative void left after the last Aliens movie came well over a decade ago. Colonial marines, duplicitous corporate managers, insane military leaders, hive after hive after hive of alien hell, The Complete Aliens Omnibus: Volume 1 has it all and does not disappoint. The novels are so well written that it may be hard for Hollywood to top them when and if they revisit the Aliens franchise. But until Hollywood does, there are now plenty of novels for fans to dig their teeth into and get their Aliens fix. Jake Bible is a prolific author of YA and adult novels and short fiction in horror, action/thriller, and science fiction, as well as works that combine elements of multiple genres. He is also a screenwriter and inventor of the drabble novel.